Was Ali Abdullah a product of Yemen, or was Yemen a product of Ali Abdullah? The answer is a complicated mix of personality and history, and what it reveals promises an even bleaker future for this desperate and beautiful and time-torn land. Last week, we looked at the (admittedly impossible) idea that the United States might break with Saudi Arabia over Yemen, and then over the murder of journalist Jamal Khashoggi. I still think it is impossible, but just today the President of Turkey made it very clear he believes the murder was premeditated, and not the result of the laughably absurd fistfight. Now, it is not the official policy of this blog to turn matters of truth and morality over to Recep Tayyip Erdogan, but in this case, we’re inclined to believe him. At the very least, the Turkish intelligence community has been sitting on information for weeks, letting it drip out to counter ever Saudi lie. It’s been sort of masterful, if you ignore the backdrop of a man’s brutal torture and murder. The Turkish angle here isn’t entirely clear, though it also seems pretty obvious on the surface. They have been vying once again with Saudi Arabia for the leadership role in the Middle East, and indeed the broader Muslim world. For 1000 years Istanbul was the heart of Islam, and while it is reductive and probably Orientalist to say they want it back, the idea of Turkey as a world-historic power is part of Erdogan’s appeal. We’ve talked about how in the post-West Middle East, powers like Russia, Turkey, and Iran were circling back to familiar patterns. This isn’t due to historical determinism, but rather to the realities of political geography. They are all jostling over borderlands. And while Saudi Arabia isn’t on a border with any of them, there is an imaginary borderland between the Arab world, the Persian one, the Turkish one, and the Russian one. Saudi Arabia has positioned itself as the true fighter for the Arab world against Iran, and successive US administrations have rushed to reward them for it. But the eager complicity of Obama, while real and a true stain, pales in comparison to the headlong alliance the US under Trump has forged with Saudi Arabia. Their mutual obsession with Iran, and the ahistoric and indeed idiotic idea that it has no rights to influence the region, have created a relationship based on murder and mutual complicity. But let’s say that it changes (it won’t). Is a Saudi/Russian alliance possible? We have seen a lot of commentators say that we can’t lose the alliance of the House of Saud, for economic and geostrategic reasons. They’d move into the arms of Russia or China. Russia is possible, I suppose, in the short term, but I don’t really see it being a lasting thing, for a few reasons. Russia is already involved in the Middle East on the side of Asad and ostensibly Iran, so are basically opposed to Saudi interests. Cynicism could allow for flexibility, as the Russian position isn’t based on any strong regional ideology, but there are too many inherent contradictions. Russia doesn’t need Saudi oil. The US doesn’t really, either, but Russia would much rather be the sole supplier of Europe’s energy than enter an alliance with a potential competitor. These can surely be overlooked for a time being. There is no doubt that Moscow is using this as a wedge issue. They made it clear that the murder of a journalist doesn’t bother them in the slightest. They didn’t explicitly say “Come on- you really think that bothers us?”, but the implication was pretty obvious. Western governments are acting horrified, and maybe they are. Angela Merkel said they might stop selling arms to the Saudis (which, could have happened over Yemen, but small victories, I suppose). Western mucky-mucks are pulling out of the obscene Davos in the Desert wankfest. This gives Russia an opening. If Russia were to become a patron and ally of Saudi Arabia, with enough skill they could be the main power broker in the region, bring a rough peace to Syria, and play Iran and the Saudis off each other. That is probably the Russian angle here, at least in the long run. The short-term is just to cause chaos. But I don’t think they have that skill, and anyway, if the US were to back away, China is the much more likely suitor. Energy and resources without strings attached is the Chinese approach to foreign policy. That would be a far snugger fit for the Saudi ruling clique. I don’t really think any of this will come to pass. In announcing that the US has no intention of giving up arms sales, the Trump administration has inverted the idea of the client state. We know we let “useful” countries do essentially whatever they want as long as they are useful. But now we’re saying “we’ll do whatever you want if you give our richest corporations some more money.” Trump has made the US a client state. But still: the outrage from the West has to make the Saudi nervous. If they didn’t have such a stalwart dipshit as their primary ally, they could be in trouble. I think they’ll be casting for closer alliances with China, while using and being used by Russia. This, combined with growing Turkish ambitions, threatens even more instability. Erdogan is clearly trying to influence internal Saudi politics and shake up the ruling family. Russia is trying to play all sides without a long-term strategy. Old alliances aren’t exactly crumbling, but are revealed to be shakier. A million temporary alliances of convenience come and go. We’re not quite in the post-US Middle East, but we are in a state where the US is just another player, a powerful one, but one dumber and less rich than it thinks. That’s very dangerous, and promises a region where new weapons and strategies fit bloodily over old patterns. Writing for Lawfare, my good and great friend Greg Johnsen discusses the three wars currently happening in Yemen: the civil war (encompassing both the Houthi war against the “central” government as well as the southern secessionist movement), the regional war (Saudi Arabia/UAE against Iran) and the war against ISIS and al-Qaeda (in which the US is droning and bombing at its leisure). It’s a damn interesting piece, and Greg does a great job of showing how all these wars are intertwined. ISIS and AQ aren’t just fighting against the west; they are trying to get land, are fighting the Houthis, and of course have a simmering battle against each other. The drone wars against them waged by the US are mixed up with our mindless and cruel and self-defeating support for Saudi Arabia and the UAE, a brutal perversion of the AUMF while at the same time its full expression. Greg argues that the regional component, while the most outlandishly deadly, has the easiest “off-ramp”; both sides could agree to stop arming combatants and cease any involvement. That’s not “easy”, per se, since sunk cost, national pride, and other somehow-important factors would have to be overcome. But it is possible, and as the war gets more mired, and as disease slithers its way to the front pages, and as the Saudis and Emiratis are increasingly blamed for Yemen’s genocidal starvation, it is likely they’ll find a way to leave. That’s when, in Greg’s telling, the real fighting will begin, and there will be no way to put the country back together. The Houthis have made a lot of enemies during their time in power, but have largely been given a pass by many under their control due to the Saudi-led coalition’s bombing campaign. When that ends, so too will some of their support. There is, simply put, no longer a single Yemen. There are multiple Yemens and no single individual or group capable of re-uniting them into a coherent whole. Yemen has too many groups with too many guns to ever be a unified state again. The civil war, which has taken a back seat to the regional conflict over the past three years, will eventually resume at full force. And when it does, the fighting it produces will be bloody and protracted. Speaking militarily, Greg is absolutely correct. There is no one capable of uniting Yemen into a coherent whole. There’s no Lee who can bring a rebellious enemy to heel. But even if there were, I don’t think Yemen could ever be back the way it was, simply because the “way it was”, as a unified nation, never really existed. Uneasy unification in 1990 was followed by a civil war in 1994, after which the south was virtually occupied by jihadis returning from Afghanistan. A decade later, the Houthi wars started in the north, an area which had been under essentially military rule after the civil war in the 1960s. The southern secessionist movement began in full force in the aughts, and never really abated. What, then, is there to put back together? Hell, it’s been 150 years since the US fought its war, and we’re still fighting political battles divided by region, as well as fighting over the role of the central government to do simple things like enforcing civil rights. And we’re a rich and powerful nation, in which tax money is spent freely around the formerly-rebellious parts, and they have a full and even disproportionate representation in politics and military. That’s the textbook way to reconcile after a war, and we’re barely hanging on. Yes, there are complicated reasons for that, but that’s the point: these things don’t heal. So I don’t know if there is a chance for Yemen to ever again be one nation, because it never really was. The pieces to be put back together don’t really fit together, even before war and disease and starvation shattered them further. Just because we draw the map of Yemen based on 1990 borders doesn’t mean that’s the way the map has to be. Political maps are a perception; they are a snapshot of a moment in time, giving the essential absurdity of borders a place of primacy over the lived reality of geography and history. They tell a story, not the story. Greg’s piece is an important part of a growing body of work among Yemen experts arguing that we can’t try to force unity, and have to build legitimacy from local experts. The sooner the international community recognizes that, and the sooner it stops thinking of every solution as state-based, the closer we get to ending this endless horror. Is War With Iran Coming? You probably saw this yesterday. If you spent any time online yesterday, you probably saw that it became a meme. Everyone was doing mocking tweets of it, for petty grievances or incredibly specific references to their particular profession. Here’s Uproxx calling it an “incredible meme“, which, immediately, seems to be a fairly blithe and stupid and of-the-moment self-reflective response, a product of our warped media age, to the President of the United States sounding like a maddened incel about nuclear war. Of course, it also could be self-protection, a layer of irony to shield ourselves from the horror of the day, from the fact that this half-bright toddler, made dumb and cruel by wealth, could kills hundreds of thousands, if not more, without anyone legally able to stop him. Maybe making jokes about everything perpetuates our false and woozy times as much as it protects us from it, but if we’re already in that terrible loop, it’s hard to get out. Or maybe the reaction of Iranian Foreign Minister Javad Zarif summed it up. He doesn’t take Trump very seriously. He sees this as bluster, the same kind that led to the North Korean “talks”, in which NK didn’t change their position at all and the US gave up its biggest bargaining chip. More likely, he understands that Trump is seen as weak after clearly kowtowing to Vladimir Putin in Helsinki, and needs to rally Republicans that are more than ready to circle the wagons for him. I think that’s dangerous though. It is dangerous to draw parallels between North Korean bloviating and threatening Iran. For one thing, inasmuch as there is a Middle East strategy in Trump’s empty toothpaste tube of a mind, it is to side with a coalition os the rich Gulf states (minus Qatar) and Israel against Iran. There are obviously a million problems with that plan, and I think even in a moral vacuum it is ultimately unworkable, but I can at least make the case that there is a strategy (again, with the caveat that this team isn’t able to pull it off). For another thing, as hawkish as some of his team was on North Korea, that was small beer compared to their warboy attitude toward Iran. Secretary of State Mike Pompeo, the Christianist bigot, doesn’t really believe Iran has a right to exist as an independent, non-colonized state. He thinks it should be a vassal to the West and have no say in its own destiny. General Mattis is more rational and not driven by bigotry, but he (to a large degree correctly) sees Iran as the main driver of conflict with the US in the region, particularly in Iraq. He knows that Iran is responsible for chaos and the death of US soldiers in the region. One could argue that there shouldn’t have been US soldiers in Iraq, but that doesn’t (and probably shouldn’t) matter to Mattis. His job was to fight for the US, and so his overall Middle East perception is that Iran is the enemy. He is, after all, a general, with the good and bad that brings. And John Bolton? Do you even have to ask? It’s not just Bolton. The entire GOP and most of the Democratic Party has seen Iran as the primary villain in the world since the moment the last primary villain, Saddam Hussein, had his statues toppled. There is actual weight behind this push to war. It’s important to ask why. If you want, you could trace the last 40 years since the revolution and the hostage crisis, or go back to 1953 when the CIA helped overthrow the elected government and reinstitute the decadent and almost louche cruelty of the Shah’s regime. But this is about more than just specific events. It is Great Power competition, as the US, the last vanguard of the West in the Middle East, tries to maintain its dominance of the last 150 years. US actions in Iran must be analyzed by the individual players and the truth of recent history, but they also have to be seen through the prism of colonialist appetites and the reemergence of a historic power, partly due to a reaction to said colonialism. That’s what Zarif meant in his tweet. Iran, in one form or another, has been around since Europeans were living in huts along muddy rivers. It has continuity, and even though Europeans have dominated recently, that’s a historical blip. Trump is just fighting a rearguard war. He’s also assuming that this is just bluster, and is playing the role of statesman, almost laughing at Trump, rolling his eyes. “Yes yes- oh, is he yelling again? Goodness, how frightening!” I think that’s his primary goal here, taking advantage of the broken Western coalition, and showing that he is more reliable than Trump. And, thanks to Trump’s actions, that’s not a bad plan. This is very bad. For one thing, Trump’s peak idiocy, exemplified by violating the JCPOA, strengthens the hand of Russia and China in the region, mostly the latter, and weakens any US attempt to bring a modicum of stability. For another, it somehow makes Iran look like a reasonable power. It’s not! The regime is as cruel as the Shah as even more oppressive, corrupt to the bone, and stifling to generations of Iranians. It exports war and terror around the region. Even if you agree that Iran should, or at least absolutely will, reassert itself as a regional power, there is no way to argue that the current regime is doing so responsibly or is a force for good. That’s not a call for violent regime change. That would be another generational disaster, would lead to ridiculous chaos and suffering, and could break the US military or force it to reinstitute the draft. But given the weight of the two countries, and Trump’s need to show strength, we could drift toward war. Even if you think Trump is blustering in order to sound tough and repeat what he sees as his huge success with North Korea, these things can have a momentum. Given the teams in place, it is far from impossible. In the long run, this is a common story. A fallen empire, made weak and soft and stupid, is dominated by outsiders, who eventually get weak and soft and stupid themselves. At the trough of their decline, they are led by the very worst, and have one last desperate attempt to reclaim what is “theirs”. A generation of violence and upheaval follows, and the newer empire fades into infighting and irrelevance. In the long run, that’s a common story. Unfortunately, we don’t live in the long run. We live in the present, which has become mirrored and refracting, an endless series of impulses and truthless narratives and escapes. But no matter how many memes are made, the forces of history have a way of imposing reality. America in the 21st century is not immune to that. That we ever thought ourselves inoculated have made us impossibly sick. One of these men is a terrible monster, but this is still good news. We’ll take what we can get. In the late 90s, Ethiopia and Eritrea, two states, large and small, united and divided by the forces of history, waged a fierce and terrible war over a handful of dusty towns and lifeless fields at the heart of their disputed border. In fighting that resembled the pointless muddy carnage of WWI, trenches appeared in this no-man’s land, poison gas was used, and tens of thousands lost their lives for no gain on either side. By 2000, with both sides exhausted, a state of not-war was declared, though peace was elusive. A UN commission awarded the territory to Eritrea, but Ethiopia never accepted it, and war was still always on the table, balancing on a knife edge in the fierce heat of the Horn of Africa. 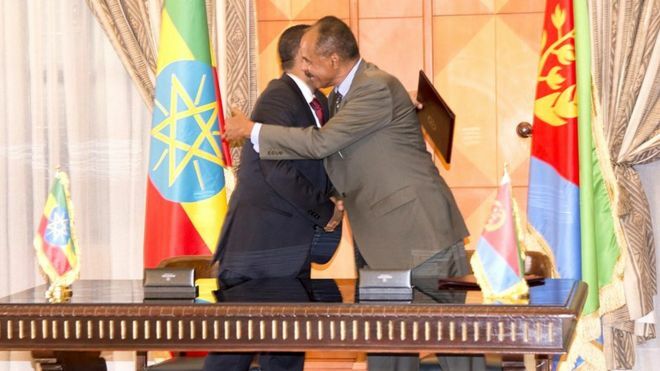 The leaders of Ethiopia and Eritrea have signed a declaration saying that the state of war between the two countries is over. A peace deal ending the 1998-1999 border conflict has never been fully implemented and there has been tension between the neighbours ever since. The countries have also agreed to re-establish trade and diplomatic ties. The declaration came at a landmark meeting between the two countries’ leaders in Eritrea’s capital, Asmara. The summit between Eritrea’s President Isaias Afewerki and Ethiopia’s Prime Minister Abiy Ahmed marked the first time the neighbours’ heads of state had met for nearly two decades. This is very good news. From a US perspective, it means that our main ally in the Horn of Africa, Ethiopia, will be less distracted by their disputatious neighbor. That can only help in the on-going fights against AQAP and ISIS and al-Shabab in the region (merely stating a fact, not saying that our methods/tactics are good). Beyond the US, of course, is the possibility of peace in the region, a genuine one, instead of the tense terrors of the last 20 years. Or really, the last 70. And because of this, we can see that not all conflict has to last forever, even the seemingly intractable. For those not familiar with the history, Eritrea was part of Ethiopia, but only due to the weird legacy of colonialism. It had been a collection of kingdoms and sultanates, Christian and Islamic, demonstrating the eclectic intermingling at one of the world’s inflection points. It’s a mix of sub-Saharan Africa, the Arabian Peninsula, north Africa, and more. Indeed, it is much more relevant to think of it as a Red Sea country than an African one. It’s ties are to Yemen, Somalia, Djibouti, and of course, Ethiopia. But not by choice. Ethiopia was invaded by Italian fascists, led by noted fascist superstar and street-named-after-guy Italo Balbo, and they brought together these independent kingdoms into Italian Eritrea. When the fascists lost to the English, both Ethiopia and Eritrea were “administered” by the British. When that got to be too expensive, the Brits just lumped everything together and gave Eritrea to Ethiopia. This was sanctioned by the UN and Western nations under their longstanding and time-honored policy of “Eh, they’re pretty much the same”. Needless to say, this didn’t lead to a state of peace, especially when vicious Ethipoian leaders made a point of harassing and starving restless regions. 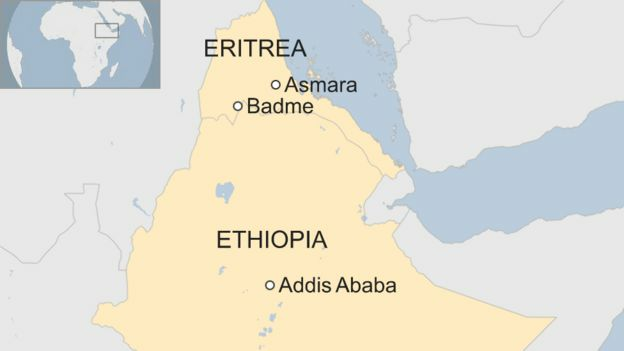 A civil war took place over the course of decades, with “rebel” troops entering the Eritrean capital of Asmara in 1991. That paved the way for a de facto state, made de jure in 1993. So needless to say there’s been some tension, and the 1998-1999 war was as much an exercise in revenge and historical anger than it was about a handful of cities. But time, apparently, can sometimes heal wounds, and countries don’t have to be beholden to the past. They can actually get past it, and move forward. I know that sounds antithetical to most of what this blog has been preaching over the years, but the not really. I think we have to be aware of the past, to understand its terrible pull and grasping hold, in order to move past it. When we aren’t aware is when we get in trouble. When we don’t try to understand the historical forces working against us, the ground underneath our feet, is when we are caught unprepared. I don’t want to say things are good over there, now. The President of Eritrea is still Isaias Afwerki, who once seemed like a brave new leader, but has since descended into brutal, paranoid madness, a Stalin-like leader who has maybe surpassed the darkest days of Mengistu. It’s a police state gripped by terror and brutality, and with its own insurrections in the name of freedom. There’s a long way to go. But this is a day no one thought could ever come. So to that, we’ll celebrate, still wary, but relieved. There can be good news, even in these dark and weird times. Donald Trump is objectively the much better person here. Weird, right? I also certainly don’t want to pretend that what happened overnight was worse or comparable to nuclear war. It was much better! If I had to choose between a preening Donald Trump and the melting annihilation of human life, I’d choose the former, at least seven or eight times out of ten. But let’s also not pretend that yesterday was anything more than preening. I can’t say for certain that this was a huge victory for Kim, or that the optics of him meeting with a world leader solidifed his standing in his country or around the world. 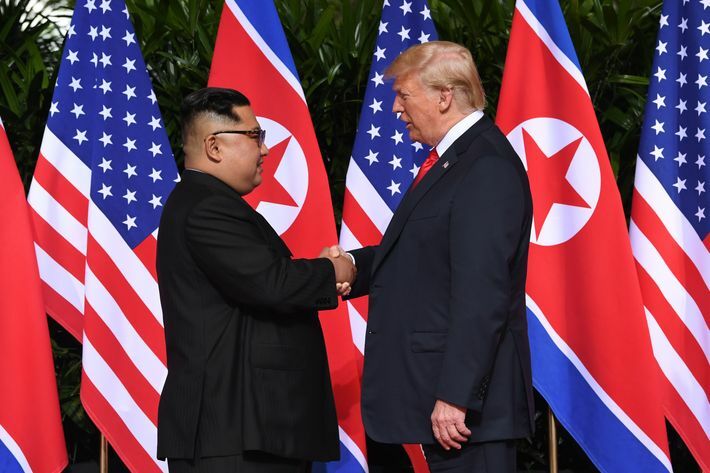 That Donald Trump basically abdicated America’s historic alliances over the weekend undercuts that a bit, though I suppose Kim might be able to convince the North Korean media to portray it as a historic victory. This summit was optics, which is not nothing in international relations, but is also far from everything. You knew it was going to be optics when they announced that Trump was leaving a little early and that he only had 45 minutes of one-and-one scheduled. You knew it was optics when the Department of Energy wasn’t included in the summit. You knew it was optics, honestly, the second Trump got involved. This isn’t how summits work. They don’t begin with the President off-handedly announcing he wants to meet. There is months and years of prep work, negotiations and agreements, painful discussions about language as both sides test and push limits. Then the leaders get together and wrangle over the end. In a way, I get why Trump’s approach is appealing. He’ll cut through all that bluster and just get the job done because he’s a master negotiator. He’ll size Kim up within a minute and figure it out. That’s a fun thought! If you like Donald Trump, that sounds cool. The problem is that Trump the actual human being has little to nothing in common with Trump the Image. He’s not a good negotiator, is wildly susceptible to flattery, and goes into talks with nothing more than half-baked notions he gets from half-watching Fox and Friends. None of this is an exaggeration. When he said he’s been preparing for these talks his whole life, he just means that he likes haggling with people. It also means he literally hasn’t been preparing at all. Again though, I’m skeptical, because nothing in the signed documents indicates any different pressures or timetables than any other accord ever signed, or even North Korea’s official position (which is they truly and sincerely and why won’t you believe us don’t want nukes, but dream first of a nuke-free world, so you go first). Instead, Trump got a vague pledge and a can kicked down the road. As Trump kept saying, though, this was just the beginning. But I don’t know. This is his chance to say something went great and then ignore it, and if Kim doesn’t follow through, shrug his shoulders and say he tried. It’s hard to take Trump’s pledges of follow-through seriously. All he does is promise something will happen down the road in order to claim victory, and then do it all again down the road. He also got Kim to agree to return the remains of American POWs, which is certainly a good thing, but that’s also the kind of good-faith gesture that should be the prerequisite of any meeting. And what did we give up? Well, for one thing, Trump continuously reiterated his desire to bring home all our troops from South Korea, which is, I guess, fine, except for two points. 1) Saying you really want to do something super badly is not exactly a common tool for a great negotiator, and 2) doing so just because Kim promises to denuclearize still leaves South Korea entirely vulnerable to NK’s conventional forces. Even before the regime went nuclear, the fear was that any conflict could kill tens or hundreds of thousands of people n Seoul just from artillery strikes alone. Indeed, I think the big outcome of these talks was that Trump agreed to stop us military exercises with South Korea. Here’s the full transcript of that. We have done exercises working with South Korea for a long time. We call them war games. I call them war games. They are tremendously expensive. The amount of money we spend on that is incredible. South Korea contributes, but not 100 percent which is a subject that we have to talk to them about also. That has to do with the military expense and also the trade. We actually have a new deal with South Korea. We have to talk to them. We have to talk to countries about treating us fairly. We pay for a big majority of them. We fly in bombers from Guam. I said where do the bombers come from? Guam. Nearby. I said great. Where is nearby. Six and a half hours. That’s a long time for these big massive planes to be flying to South Korea to practice and drop bombs all over the place and go back to Guam. I know a lot about airplanes. Very expensive. I didn’t like it. What I did say is and I think it is provocative. I have to tell you, Jennifer, it is a provocative situation. When I see that and you have a country right next door. Under the circumstances we are negotiating a comprehensive and complete deal. It is inappropriate to have war games. Number one, we save money. A lot. Number two, it is really something they very much appreciated. I’m glad North Korea appreciated that! And I’m glad you gave us a deep dive into your tremendous knowledge about airplanes, to let us know that flying them is expensive. You know who wasn’t totally on-board with this plan? Our allies in South Korea, whose military didn’t know that you were canceling these. And neither did ours. US forces in Korea said they had not received updated guidance on military exercises. This is classic Trump. He’s been all rankled and wrinkly about having to pay for joint military exercises, because all he sees is money and not value, and has no understanding about how these things work or why we do these exercises. So Kim can just say “these are really expensive” and “we’d appreciate it if you stopped” while whispering about nuclearization, and Trump gave up the store. By “gave up the store” here I mean he sold out our allies. This is a disaster for South Korea, and I think people are just realizing that now. He values Kim’s smiles more than Moon’s security. And you know who else loves that Trump looked at the price tag (though not the value) of exercises in the region and gave them up? China. So this is a huge victory for China and North Korea, and a loss for South Korea, Taiwan, and Japan. You might recognize that as a general inversion of American policy. But that’s what he’s been doing. In the press conference, he is asked about the G7, and goes off on Trudeau for paragraphs at a time (calling him “Justin”), and doing a play-by-play of his own imagined version of events. So to recap, he spent the last few days severing alliances with our friends and strengthening our rivals, if not openly advancing the interests of geopolitical enemies. That’s why this whole thing struck me as sort of a farce. Obviously, anything Trump is involved in is at least partly farce. That’s part of why I wonder how much of a triumph this is for Kim: there was hardly more dignity in yesterday’s meeting than in his palling around with Rodman. Trump might have been elevated, but he’s still a tacky casino operator and reality show star. But what really struck me as false and horrible was when a CNN anchor said that it was a victory for Kim to be “meeting with the leader of the free world.” When that leader openly sides with Russia and China over Canada and Germany and the UK, when that leader officially closes our doors to victims of domestic abuse and gang violence, when that leader tweets out praise for the Supreme Court allowing voter rolls to be purged, then he’s not the leader of the free world. He’s just a member of a much darker and crueler world. Maybe that’s why they got along so well.